New book, 48 pages, NVG093. Over the last two decades, the Israel Defence Force (IDF) has introduced a variety of new AFVs. Old models such as the M48 and M60 have been improved beyond recognition, in the form of the Magach 7. The performance of Israel's indigenous Merkava tank has been similarly enhanced with new variants and the new Merkava 4 MBT has recently entered service. 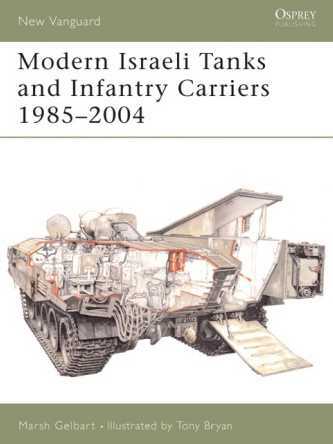 Israeli infantry have also received machines such as the Achzarit assault carrier, the Puma combat engineer vehicle and the Nagmachon and Nakpadon (tank-based carriers intended for low intensity conflicts). This book examines the design, modification and combat history of these formidable fighting machines. Contents: Introduction; Design and Development; Operation History; Variants; Colour plate commentary; Index.